Virat Kohli and Anushka Sharma are now in Delhi and in the middle of a grand reception party for their folks tonight. Ever since news of their secretly tying the knot in Italy’s Tuscany came out in the open, the world has been going crazy. Picture after picture has emerged from the fairytale wedding, inviting collective aww’s from all of us. The gorgeous couple took their wedding vows in a breathtaking locale in Italy, looking every bit gorgeous, both dressed in signature Sabyasachi ensembles. 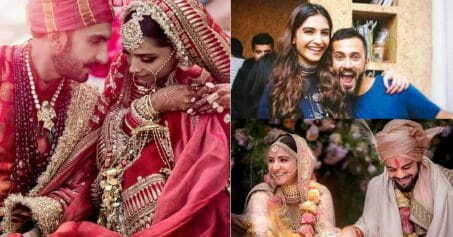 The bride, Anushka wore a stunning Sabyasachi lehenga in beige and pink, while Virat Kohli made for a handsome groom in a white sherwani. Also read: MORE DETAILS: Who Were The People Behind The Hush-Hush Fairytale Virushka Wedding? The reception is being held at Durbar Hall at Taj Diplomatic Enclave in New Delhi. The event was scheduled to start at 8.30 pm. We got our hands on some pictures straight from the venue and they are gorgeous! 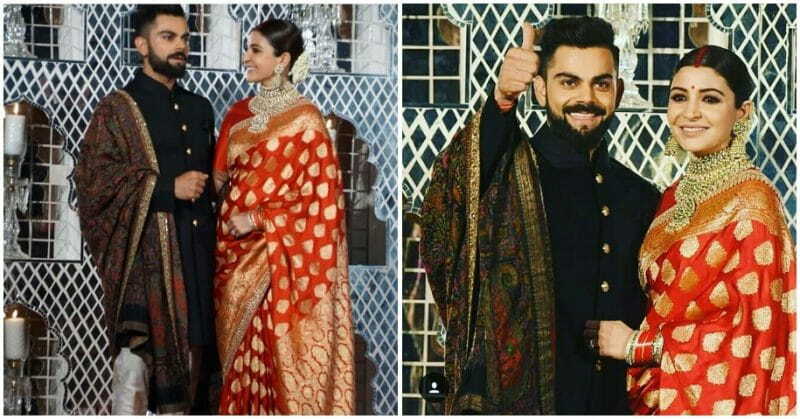 Anushka Sharma wore a stunning red Sabyasachi weave while Virat Kohli matched up in a black sherwani with a shawl. Her very evident sindoor is making her look as bridal as bridal can get! Their 700-guest party is managed by Devika Narain, the same creative responsible for their enviable Tuscany wedding. We are completely admiring Virushka’s pictures and we promise to update you as we get more! Can’t wait! Here’s Everything You Need To Know About Virat-Anushka’s Reception Today In Delhi!